Cynognathus, a large Early Triassic cynodont that ranged widely across Southern Pangea (fossils are known from South Africa, South Ameriuca, and Antarctica). 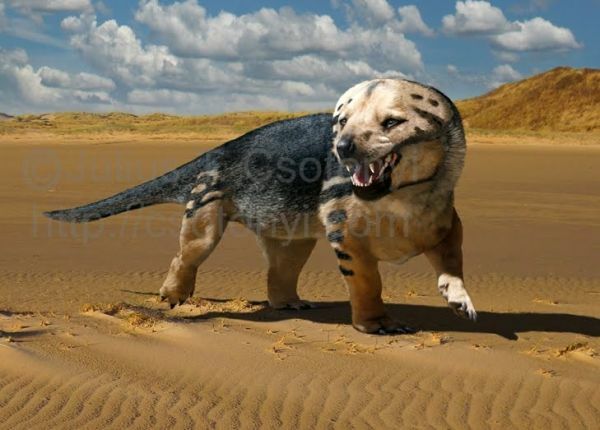 See BBC Cynodont for another illustration of this same animal. In the unbroken evolutionary sequence from reptile to mammal, the cynodonts are intermediate between earlier and more primitive theriodont therapsids and the earliest mammals. These highly successful animals first appear in the late Permian, radiate quickly into a number of different forms (including both terrestrial and semi-aquatic) before the end of the period, reach their maximum diversity in the Early Triassic, and become increasingly mammal-like as the Triassic progresses, giving rise to true mammals in the later Triassic. By the start of the Jurassic, only the insectivore-like tritheledonts and rodent-like tritylodonts remained; the latter continuing alongside true mammals throughout the Jurassic and even into the early Cretaceous.